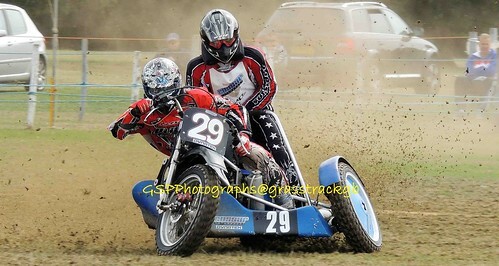 Class: Right-hand Sidecar (Driver / Passenger). Passengers: Gareth Williams, Krystal Kidd, Sam Howells, Wayne Rickards, Ryan Barker, Michael Chittenden; Drivers: Mark Cossar, Peter Lloyd, Will Offen, Gary Jackson, Mark Warren. Family Connection: Andy Cossar (Father), Mark Cossar (Brother), Jeni Cossar (Sister), Sinead McLaren (Cousin). Eastern Centre Championship: Second 2018. South-East Centre Championship: Third 2018. Battle of Britain: Second 2018. Mick Steer Trophy: Second 2018. Mick Steer Memorial: First 2009. 2018: First Maidstone, Bewdley, Second Bridgwater, Ledbury, GWR, JCR; 2017: First Bristol, Third Ledbury, Bristol; 2016: First Ledbury, First SCA; 2013: Second Cheshire; 2011: Second Somerton; 2009: First Grassroots, Bewdley, SWeGA, Midshires, Third Fenland; 2008: First Maidstone.